After breaking up with my last ex, I made a list of qualities I was looking for in a significant other. I was determined not to start another relationship that was bound to fail, or slide back into old patterns that made me miserable. Each time I met a new guy, I mentally scanned the listâ¦easy going, check; talks things out instead of walking away, checkâ¦Fifteen years later, Iâm still happily hitched to the man I married just four months after we met, and I think the list has had a lot to do with our staying power. Now Iâm a nutritionist, not a relationship expert, but I actually use this same technique in my private practice, to help clients ditch bad diets forever, and develop harmonious relationships--with food--that result in long-term weight loss. This week, as we begin a new year, I encourage you to create your list, one that includes what you really need from an eating plan, as well as attributes youâre certain just donât work for you. Iâve seen this exercise help clients finally stop the vicious cycle of starting another diet that fizzles out after a few weeks, or gaining back fifteen pounds after losing 10. In fact, this upfront tactic is actually one of the most effective ways to lose weight for good, because it will help you find an approach you can stick with, which in my experience is the most important ingredient for success. If youâre game, take out a sheet of paper. 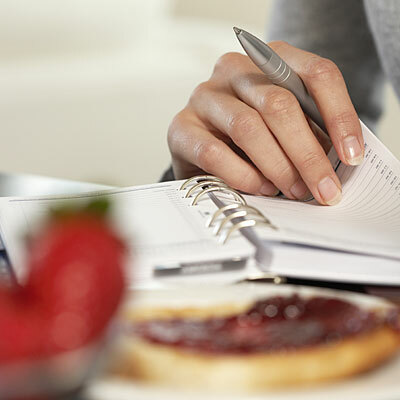 On one side, write down the âmust-haveâ characteristics youâre looking for in an eating strategy. Some of my clients will list things like: must include foods I enjoy; must be easy to follow; and must allow for splurges and dining out. Once you have your list, use it to evaluate any and every plan that comes your way. I once had a client who was considering starting a diet that only allowed one type of fruit. She was enticed, because a co-worker following the program appeared to be shrinking by the day. But this client loved fruit, and in the past, she eventually gave up on any diet that deprived her of foods she knew she couldnât live without. And by giving up, I mean she binged on forbidden foods, and wound up right back where she started. We talked about the fact that she probably would lose weight on this plan, but in her gut, she knew that shunning winter grapes, spring cherries, summer melons, and fall pears (all no-nos) was going to make her resentful enough to eventually dump the diet, and fall right back into the old habits that led to her 40 pound weight gain. To break the cycle, she had to find a strategy that would not only help her shed pounds, but also allow her keep the weight off, because it felt good enough to stick with. In other words, much like dating, if you canât see yourself in the relationship six months from now, itâs probably not going to work, and in both love and weight loss, stick-with-it-ness is ultimately what matters most. Have you struggled through enough diet disasters to vow not to repeat the past? Does pinpointing the qualities you need in a sane and sustainable relationship with food make sense? If so, trust your gut. Youâre bound to come across a ton of weight loss methods this month, but if your resolution is to never have to make another weight loss resolution again, create your criteria, and stick to your guns!